St.-Anne’s church at Annaberg, by Jakob Heilmann, from 1513 onwards. These astonishing constructions rank amongst the finest masterpieces of architecture – extremely demanding from the structural point of view and particularly challenging in their geometric design. How were they designed, and how did their builders conceive the structural behaviour? 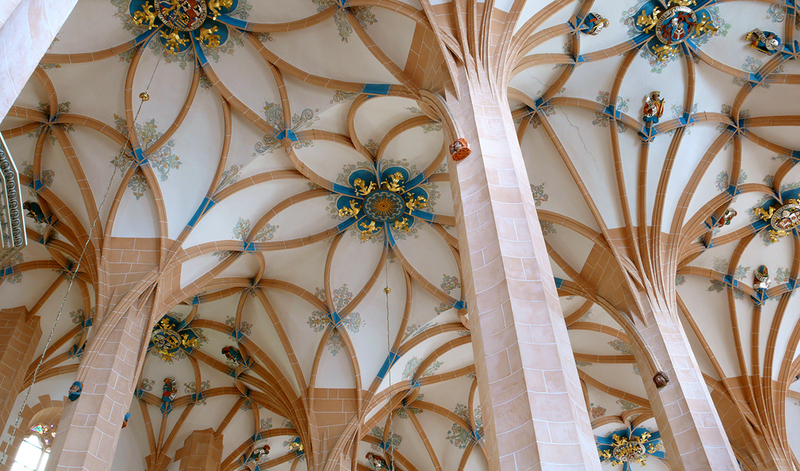 During the 15th and 16th centuries, the challenge of creating vaulted ceilings lead to ever more complex solutions in late Gothic architecture. These ambitious, astonishing and sometimes daring constructions rank amongst the finest masterpieces of architecture – extremely demanding from the structural point of view and particularly challenging in their geometric design. Their builders managed to overcome the difficulties of planning the complicated spatial meshes of stone ribs, providing instructions for the production of their single components and their assembly on the building site, and achieving a curved vault surface which corresponds to the equilibrium condition of spatial structures. The project aims to understand how these structures were designed, which geometric concepts were used, how the information was transferred from design to construction, which mathematical and structural theories were implemented. This can help us to learn more about organization and communication on the building sites, and gives an insight to the knowledge society in the late Medieval and Early Modern Europe. Further, this will contribute to a better understanding of the particular shape of the vaults and their components, which is intrinsically linked to the procedures of the design and making. The nature of the curves and surfaces determines the characteristic appearance of the built artefact; hence, we also hope to provide a better basis for future restorations. The main sources of this research are the buildings themselves – working backwards from surveys to the building processes, proceeding by reverse engineering and employing methods not common until now, hypotheses on the design are formulated directly from the built artefact. Complementary, these processes are reflected and reproduced in experiments, which are carried out on scale models and also in full scale, observing whether the hypotheses we develop would lead to the same result as we observe on the artefact, and thereby giving way to more detailed observations on the archaeological evidence. The revision of the previous state of research on the design principles and construction of Late Gothic vaults, also gives way to a re-interpretation of the sources, such as lodge books, treatises and drawings. One topic of the research is the design of the masonry shells of the vaults. It is generally recognized (and also confirmed in the research) that the geometric design of late Gothic vaults is principally based on the definition of the curves. However, it must be clarified to which extent and in which terms the shape of the shell, which is in reality the main structural feature, has been subject to design. Another issue is the possible connection between geometric and structural design: as we know today, there is an intrinsic interrelation between shape and structural behaviour in vaults. We aim to clarify how the design of the shape was connected with the notion of stability of vaulted structures. This gives us also a further insight to the structural concepts adopted by the builders in pre-industrial ages. A further open question regards the link between the geometric design of the vault and the proportion system of the architecture of the entire building. By observing characteristic irregularities in the shape of the analysed vaults, we are now able to describe principle features of the devices used for determining the geometric system of the vaults on the building site. Hence, we can clarify which features of the building were subject to detailed instructions, and on which criteria these instructions were formulated. These observations and hypotheses can be correlated to sources, in particular one design treatise from the context of Late Gothic architecture. Hence, the source helps us to understand the archaeological evidence, and vice-versa the evidence helps us to better interpret the source. At present, the different stages of the design – the definition of single rib elements cut in stone, as well as the geometric definition of the arches on the building site – are subject to experimental studies.